What could be happening here, at EB Games? 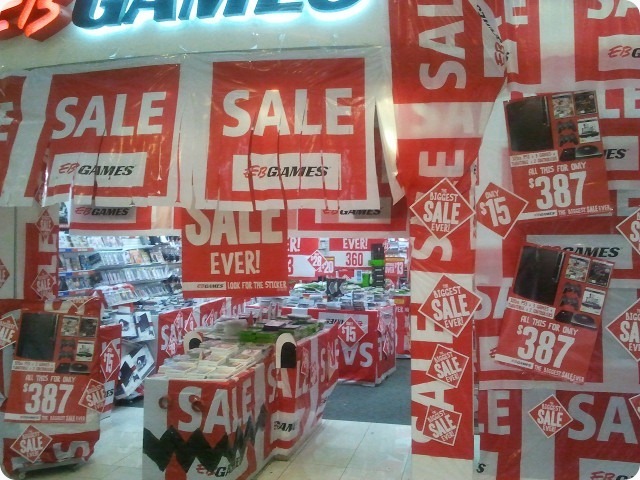 Could it be some sort of sale? It might well be too subtle to figure out. Or perhaps it is a handy way of keeping out people who are over five-feet tall, since they have to duck or to push signage away just to enter or move around the store. What can they be up to? Will we ever know? Actually, from memory, I can only recall two times in the last year that the store didn’t have numerous “sale” signs plastered over it. The signs here seem indistinguishable to the consumer eye from any other day I’ve gone past. Often there are fewer of them. I’ve only seen this density of signs at the store … well, about once every 6 or 8 weeks, really. Perhaps what they need is a “We’re not actually having a sale (for a change)” signs that they can slather over the storefront during those rare occasions. Wow, what an incredible eyesore. I’m not a huge fan of those little gaming stores to begin with; even if I were that would make me keep walking right past their door. It pretty much guarantees that I won’t walk in. I have to keep ducking and weaving under and around sale signage, and you can’t even see across the store for it.